“Right now, 1.5 billion people are living in humanitarian crisis – living in conflict-afflicted regions,” says Kate Gilmore, deputy executive director of the United Nations Population Fund (UNFPA), in this week’s podcast. Gilmore spoke at the launch of UNFPA’s 2015 State of World Population report, Shelter From the Storm, which focuses on the need to protect and meet the needs of women and girls during natural disasters, mass displacement, and humanitarian crises. According to the report, three in five preventable maternal deaths occur in conflict settings and 45 percent of neonatal deaths. Ensuring sexual and reproductive rights is an opportunity to invest in the “human capital of the adolescent girl,” Gilmore says. It is during “the toughest of times, in the hardest of places” where sexual and reproductive health and the rights of women and girls must be protected. 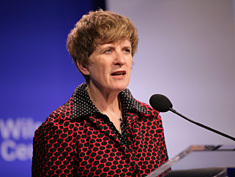 Kate Gilmore spoke at the Wilson Center on December 3.